Built with You and for You! Coordination, Collaboration, Visualization, and Verification. Use with your Projects Today! 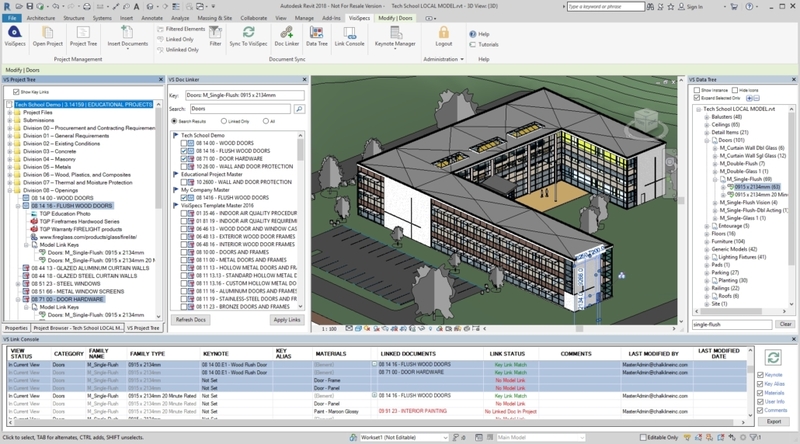 VisiSpecs is the FIRST Spec Integration Solution that runs directly in Autodesk Revit. Why force new database installations, holes in firewalls, purchase of expensive servers, IT time and training, reduced access and usage, user training, editor limitations, workarounds, and more? Applications available today are not even able to produce the entire project manual! Other applications require users to export sections to Word for final edits, TOC updates, cover page creation, and publication! VisiSpecsTM is user friendly, utilizes your currently used and installed word processor, and enhances your design process without the upfront moving of mountains! Microsoft Word is installed and used on almost every PC in our market. Specs are already available in Word format. Why force a change to convert documents into a limited editor to do part of the job and have to export back to Word to finish the job? A lot of time and money is wasted! 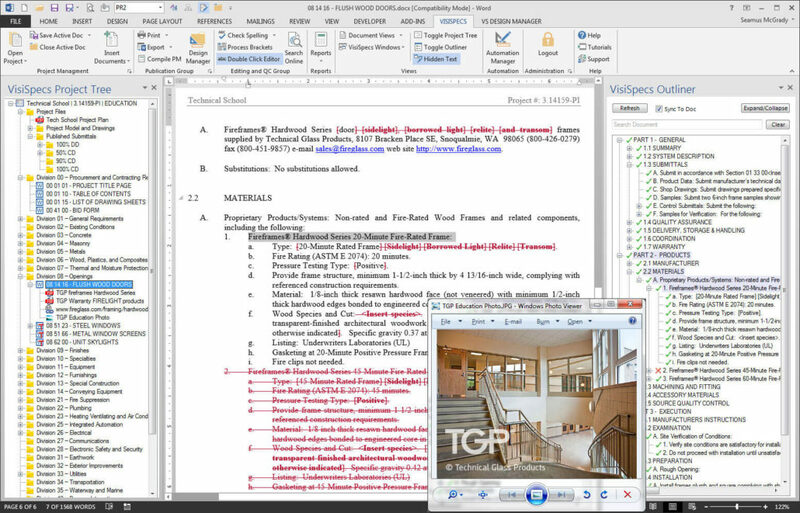 VisiWordTM is a Microsoft Word add-in with enhancements for specification writing, publishing of manuals, navigating documents, and linking Word documents and other content to your BIM models. Since VisiSpecs is managing the server and data in the Cloud, you can immediately use your documents and your BIM models to see these exciting benefits TODAY! Building design and construction is a team process. VisiSpecs enables all those involved to access the data they need, when they need it, where they need it. Reduce time and frustration sending information back and forth and instead create a central resource for your project team whether they are internal employees or external team members. Owners, consultants, legal, and principal team members can use their installed Word application to view, comment, mark-up, add cut-sheets, submittals, and more. Or use the visual VisiViewTM application to interactively collaborate on the model, parameters, and documents all linked together. Increase your team collaboration resulting in increased product quality with reduced time and costs. 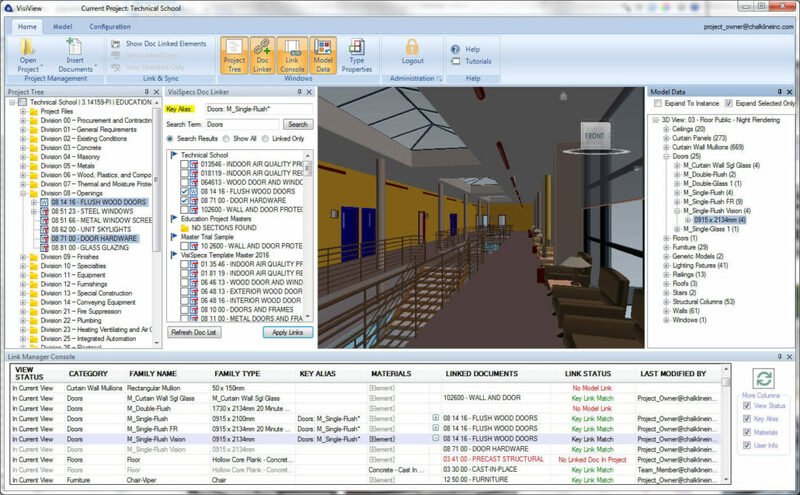 Open your model, open your VisiSpecs project, and you immediately have access to all your construction documents! Automatically insert the required specs and docs based on your model elements and materials. Open the spec directly in Microsoft Word using the most feature rich editor available. Link your model elements and materials to create intelligent links to your documents – Immediately! Why force users to change their models, use other materials, adopt a new process, or manage new codes? VisiSpecs is the FIRST BIM integrated specification system that runs directly in Revit accessing your live model(s) data enabling automation, coordination, collaboration, and verification throughout the design and construction stages. Related Project Files Go find them…somewhere Integrated with VisiSpecs Masters and Projects in customizable folders for linked access directly in VisiWord, VisiView, and VisiRevit.